It is easier to pick your own Reishi than buy it, they're a very easy polypore to find. It's best when you find a large amount of Ganoderma lucidum or Ganoderma tsugae to cut the fungi near the base of the stipe (stem), this way the fungi will grow back. When you cut it the mushroom will regenerate the fruit body from that point, so basically you will always have fresh Reishi for your health. Try to find several trees that produce Reishi so that you never run out, and NEVER NEVER NEVER take all that you find. It's best to harvest enough so that you will be set for 2-3 months, this gives the fruiting body plenty of time to grow back. Also you do not have to wait until the pileus (cap) of the fungi has turned red all over, when they're white one can harvest them and slice the soft white tips from the Reishi to put in salads. Reishi is bitter but when added to a salad, or brewed correctly it is not bad. I like to powder the Reishi first, then put the powder in size "00" capsules and take two each day. Two size "00" capsules, if filled correctly, will hold 1 gram of dried Reishi. Hi! I hope you can help. I'm looking for ways to use fresh reishi - not dried. Any ideas? I worked at a health food store for about eight years. We had one whole section of dried mushrooms in capsule form. Reishi was one of our best sellers! How interesting it is to find out more about this mushroom! Thank you! Nice info from an anonymous visitor. I agree that picking fresh Reishi is best if possible. If you're harvesting from a non-polluted area, nothing beats a mushroom straight from nature. Join in and write your own page! It's easy to do. How? 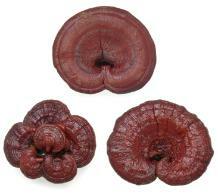 Simply click here to return to Reishi Mushrooms.